On April 1, 1999, House Concurrent Resolution No. 89 (HCR89) was read for the first time. Similar to so many bills and resolutions before it, across the country, this legislation, introduced by Representative Michael A. Walsworth, proposed that the square dance be designated the "American folk dance" of Louisiana. The resolution was read again by title and referred to the Committee on Judiciary for evaluation. After an April 14th hearing, the Committee on Judiciary returned a favorable recommendation and HCR89 was scheduled for a vote of the full House of Representatives. On April 23, 1999, Rep. Walsworth made a motion on the floor of the House of Representatives to adopt HCR89. The motion was approved, the House voted in favor of adopting the square dance the official American folk dance of Louisiana, and HCR89 was forwarded to the Louisiana Senate for consideration. In the Senate, HCR89 was referred to the Committee on Senate & Government Affairs. After almost a month, seemingly forgotten, the Committee on Senate & Government Affairs took up consideration of HCR89 and reported a favorable recommendation to the Senate. On June 18, 1999, the Louisiana Senate followed the lead of the House and approved House Concurrent Resolution No. 89. The vote was unanimous; 37 yeas to 0 nays. The Chair declared the Senate had concurred in the House Concurrent Resolution and ordered it returned to the House. House Concurrent Resolution No. 89, as agreed to in both houses of the Louisiana Legislature, was signed by the Speaker of the House (June 20, 1999), the President of the Senate (June 21, 1999), and filed with the office of Secretary of state (June 22, 1999). 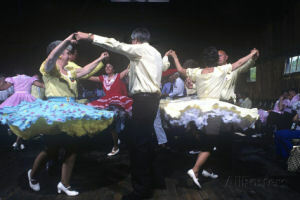 To designate the square dance as the American Folk Dance of the state of Louisiana. WHEREAS, the square dance, an integral part of our state's cultural legacy, unites participants in a shared experience, and the enduring beauty of this indigenous American dance form makes it an ideal choice for our official state folk dance and will serve as a fitting emblem for the rich diversity of our state's cultural heritage. THEREFORE, BE IT RESOLVED that the square dance is hereby designated and adopted as the American Folk Dance of the state of Louisiana. The square dance is a popular type of folk dance in the United States. This dance for four couples, or groups of four couples, is performed in a compact framework of a square, each couple forming a side. Traditionally accompanied by a fiddle, accordion, banjo and guitar, the couples perform a variety of movements prompted by the patter or singing calls (instruction) of a "caller". Cooperative movement is the hallmark of well-executed square dancing. Square dancing is to be distinguished from related dances called contra or longways dance where couples stand double file in a line and from round dances where couples stand in a circle. The origin of the square dance can be traced to English derivation and to the stately French cotillion performed in square formation that was popular at the court of Louis the fifteenth later replace by the quadrille (another square dance). 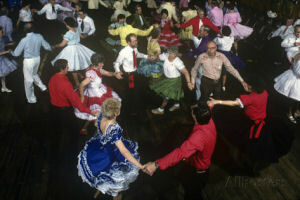 For information on how the Louisiana campaign aligned with the agenda of national square dance organizations and to provide context for the approval of the Louisiana resolution, it would be helpful to read this brief article about efforts to designation the square dance the permanent American folk dance of the United States of America. An approved concurrent resolution is not an act of law. The square dance was designated the official American folk dance of Louisiana by House concurrent resolution and is, therefore, not recorded in the Louisiana Revised Statutes . Walsworth, Mike. "HCR89 by Representative Mike Walsworth." 1999 Regular Session . Louisiana State Legislature. Web. 16 Mar. 2016. Square Dancing 101: Square dancing basic including positions, formations, moves, and a glossary. Video Square Dance Lessons Online: Video Square Dance Lessons Online and on DVD from Cyberpoint Marketing, LLC. A Brief History of Square and Round Dancing: by Herb Egender. Square Dancing: The Historical Geography of an American Folk Custom: by Richard M. MacKinnon, Allan Hancock College, Santa Maria, California. 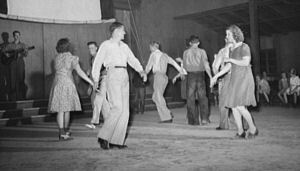 Square Dance History Project: Website devoted to the documenting the history of square dancing with historical documents and an emphasis on imagery as much as possible. History and Heritage of Modern American Square Dancing: A summary of the essays by Dorothy Shaw, Bob Osgood and Kenny Reese. The State Folk Dance Conspiracy: Fabricating a National Folk Dance: by Judy Mangin - Originally published in the Old-Time Herald, v.4(7) p.9-12, Spring 1995. National Folk Dance Effort Moves Forward: We're On Our Way Now, So Let's Make a Lot of Noise! : United Square Dancers of America National Folk Dance Committee. Official website: Louisiana Square Dance Associationsquare dancing friendship set to music. More symbols & emblems: Complete list of official Louisiana state symbols from NETSTATE.COM. While there have been countless fun books written on square dancing, Squaredance Fundamentals was the first to cut to the chase. There is no interesting history of square dancing, there are no entertaining anecdotes, just the nuts and bolts of how to square dance. Revolutionary illustrations show the dancer’s point of view, not just the spectators’ viewpoint. Dancers can, without turning on their heads, glean from the detailed illustrations exactly what they need to be doing with their hands, feet, etc. Each dancer can effortlessly grasp the material and easily retain it. Renowned master caller/teacher, Marshall Flippo, assiduously assisted the author in establishing the very first guidelines for standardized “Basic Maneuvers” which would enable square dancers to dance gracefully with any group, anywhere. No one shows you better how to execute the maneuvers than John W. Jones with his super simplified instructions and state-of-the-art illustrations in Squaredance Fundamentals - the gold standard for over 37 years. You can have fun square dancing and you'll learn how to dance the figures and even learn how to call a square dance with Margot Mayo's classic manual, The American Square Dance . Here is the basic book for square dancers containing all of the essentials for many hours of enjoyment. An illustrated glossary of square dance terms shows all of the basic square dance figures – promenade, allemande left, do-si-do, etc. Complete instructions, calls and illustrated figures for 13 of the most popular American square dances appear, plus the music all ready for your pianist and fiddlers to play. 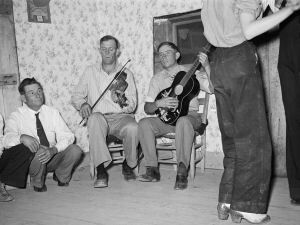 This comprehensive guide to traditional style square and contra dancing, sometimes referred to as "country dancing," covers both music and style and gives background information on various dance types and calling techniques. Ninety dances, presented in chapters according to type (mixers, progressive circles, contra, Southern mountain style, squares and others), in a wide variety of formations are described with drawings and diagrams for many of the movements. A glossary of terms, a directory of addresses (organizations; vendors of books, recordings and audio equipment; and dance camps), and an annotated discography and bibliography are also provided. This book includes: 50 basic movements, 35 advanced movements, variations, dances that are a part of the American heritage, Contra and Round Dances, polkas and reels, and calls, past and present. “Square dancing is friendship set to music,” says author Betty Casey. Just take four couples, old or young, put ’em on a good floor, turn on the music, and you’re all set. 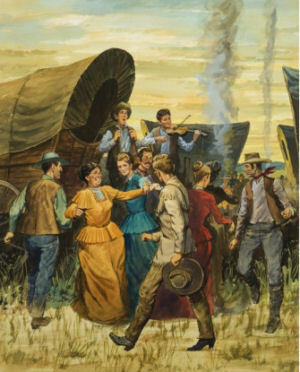 Whether you’ve done it before or you’re just starting out, this book tells you everything you need to know—85 basic movements used all over the world, the spirited calls unique to square dancing, the costumes and equipment that are best, and music (from “Red River Valley” to “Mack the Knife”) that will set your feet in motion. Square Dancing Made Easy , Grade level: K-6. Audio CD (September 1, 1995), Number of Discs: 1, Label: Educational Activities, Inc.
All Time Favorite Square Dances with Calls , Audio CD (September 8, 2009), Number of Discs: 1, Label: KADO, Run Time: 60 minutes. Square Dance Music & Calls , Audio CD (November 21, 2006), Number of Discs: 1, Label: Collectables Records. I LOVE TRADITIONAL SQUARE DANCE Black Metal Car Accessories License Plate Frame , This high quality license plate frame is made of metal, and it's the best quality item of its kind in the market. The lettering and art work are done by waterproof vinyl on the license plate frame and it will last for many years without any damage. It will not get brittle or cracked. It fits on all USA and Canada vehicles. It measures 12.5" X 6.5" and is durable to last under all weather conditions. Heavy Duty High Quality Metal License Plate Frame. Perfect Gift idea And Easy Installation. Rust, Corrode And Fade Free For Many Years. Fits all US and Canada License Plates. MY HEART BELONGS TO TRADITIONAL SQUARE DANCE , This is a high quality pre-shrunk t-shirt that will not shrink or fade. It's comfortable, casual and loose fitting and will quickly become one of your favorites. It wears and looks well on anyone. It is cured with a heat treatment process to ensure lasting durability. Brand New High quality preshrunk tee-shirt that will not shrink or fade. Double-needle stitched hemmed sleeves and bottom. Highest quality printing materials. 50% Cotton, 50% Polyester preshrunk blend. Soft, comfortable and weighs 6 oz. Social Dancing in America examines the role of social dancing in daily life from the first settlements in 1607 through the birth of the nation in 1776 and into the beginning of the 21st century. This two-volume set provides a history of American social dances including the Virginia Reel, Square Dancing, the Lindy Hop, Rock 'n' Roll, the Twist, Disco, Breakdancing, and Hip-Hop. Social Dancing in America places social dancing in a historical, social, cultural, and political context. Volume 1 explores the integral role that social dancing played in the lives of Americans from the first settlements in 1607 through the 19th century, often in the most unlikely of ways. For example, readers may be surprised to learn that George Washington was a well-known aficionado of social dancing, and that he incorporated the etiquette and manners of dances such as the Minuet as a means of diplomacy to secure European allies during the Revolutionary War. After his death, Americans continued to celebrate his birthday with a grand ball that included dancing. Volume 2 places social dance in a 20th-Century context, illustrating how social dancing itself paralled the social, economic, and cultural traditions of each era. For example, segregation and the Jim Crow mentality was cemented in place all over the United States, and for much of the century, dancing and dance halls were strictly segregated. Segregation forced a mass migration north, and with it came the transformation of Delta Blues music into an American original—Jazz. Jazz gave birth to the Charleston, and later evolved into Swing, which created the Lindy Hop. Later, with the advent of television, programming such as American Bandstand, Soul Train, Dance Fever, and MTV greatly influenced dance styles and modern trends such as Rock 'n' Roll, Freestyle, Disco, Breakdancing, and Hip-Hop.